What’s the Stem Cells Buzz this Week? - Craniofacial Bone Defect Repair, Islet Regeneration, MSC Chondrogenic Potential, and Chronic Pancreatitis MSCs! The osteogenic properties of dental pulp stem cells (DPSCs) have prompted research into their potential application in craniofacial bone repair. 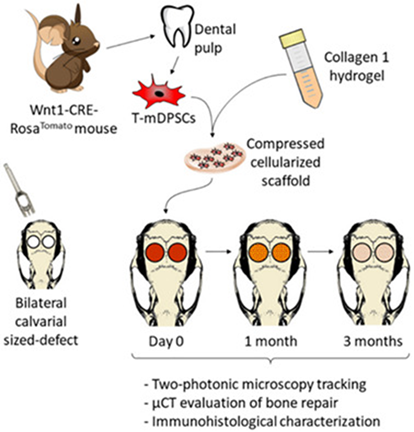 Now, a new STEM CELLS study from the lab of Anne Poliard (University Paris Descartes, Montrouge, France) has explored the repair process via studies in a mouse model of craniofacial bone defects. Interestingly, Collignon et al. establish the direct involvement of mouse DPSCs in repair via an endochondral bone ossification‐like process, thus paving the way for a deeper appreciation of the central molecular and cellular mechanisms controlling bone repair before their translation to clinical applications. While factors secreted by mesenchymal stem cells (MSCs) can induce islet regeneration, thereby representing a potential treatment for people living with diabetes, the specific identity of the critical regenerative factors remains unknown. Researchers from the laboratory of David A. Hess (Western University, London, Ontario, Canada) recently demonstrated that activation of Wnt‐signaling via GSK3‐inhibition during the generation of MSC conditioned medium (CM) promoted the subsequent β‐cell mass recovery following intrapancreatic injection of said CM in a mouse model of diabetes. Kuljanin et al. anticipate that findings such as these will contribute to the development of cell‐free therapies to combat diabetes. For more details, see STEM CELLS now! Researchers from the laboratory of Ivan Martin (University of Basel and University Hospital Basel, Switzerland) recently sought to cut through the heterogeneous nature of human bone marrow mesenchymal stem cells (BM-MSCs) by identifying cell surface markers that would identify those cells with higher chondrogenic capacity. In their new STEM CELLS Translational Medicine study, Stüdle et al. 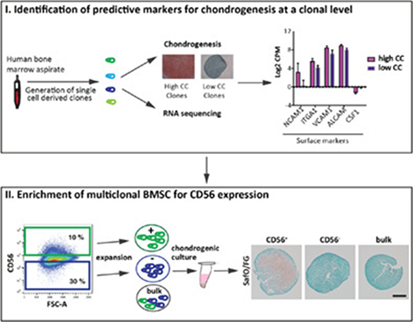 report CD56 as a potential predictive marker with the ability to select BM-MSC subpopulations with higher and more predictable chondrogenic capacity. However, the authors still note that donor‐to‐donor variability still profoundly affects differentiation propensity. New research from the lab of Hongjun Wang (Medical University of South Carolina, Charleston, South Carolina, USA) sought to discover if mesenchymal stem cells (MSCs) derived from chronic pancreatitis (CP) patients can be employed as an autologous cell therapy approach. Interestingly, Wang et al. 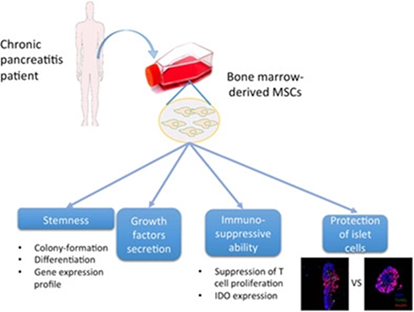 now report that MSCs derived from CP patients display a similar phenotype and therapeutic capacity when compared to MSCs derived from healthy donors, suggesting that the transplant of MSCs with islets may improve islet transplantation outcome. For all the fine print, head over to STEM CELLS Translational Medicine now!